The military has contacted the family of a service member missing from the Korean War whose dog tag was found among the 55 cases of war remains returned to the U.S. Thursday. His family will be presented that tag in Arlington, Va., next week as they arrive with hundreds of others for an annual meeting on the efforts to find their missing family members. The dog tag was among the cases of human bones and a limited number of artifacts, such as boots, buttons and buckles that North Korea said came from the village of SinHung-Ri, location of the 1950 Battle of Chosin Reservoir, said John Byrd, chief scientist for the Defense POW/MIA Accounting Agency. More than 3,000 U.S. Marines and soldiers perished at Chosin, and more than 12,000 were wounded in one of costliest battles of the war. Byrd said the North Koreans said the bones came from the eastern side of the village, which leads him to believe they are likely Army remains. More than 5,300 U.S. remains are still missing in North Korea. Byrd, who participated in previous remains transfers from North Korea before those exchanges were suspended in 2005, rode on the C-17 into Wonson, North Korea, last Friday. There on the ground, he was greeted by North Korean officers who showed him the contents of the boxes. Byrd said he performed a cursory review of bones to verify they were human. “That was confirmed in Wonson before we actually loaded the boxes onto the C-17,” Byrd said. Once the C-17 arrived at Osan Air Base in South Korea, the contents of each box were laid out and inspected by a larger DPAA team, where they also determined, based on skull and bone sizes and shapes, that there was a high probability that the remains belong to missing American service members. The North Koreans had also provided a paragraph of information with each transfer case, describing where the contents in each had been recovered. The site is the same area where U.S. teams had previously worked with North Korean teams to recover service member remains from 1996 to 2005. 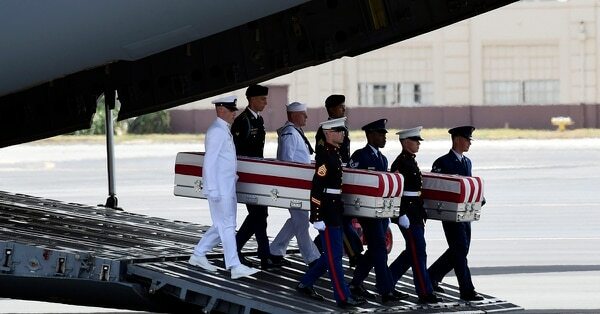 Now the team will begin the painstaking process of matching bones with chest X-rays, DNA samples or dental records to begin to learn what other lost service members may have been returned. The name on the dog tag, which Byrd would not reveal, was clearly visible, so the family was notified by the Army Casualty Office. It does not mean that any of the remains are also in the cases. “With that one identification tag we notified the family very quickly after we got the name from the identification tag, and so the family is aware,” Byrd said.